The 2002 term of the Supreme Court of the United States began October 7, 2002, and concluded October 5, 2003. 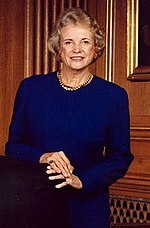 This was the twenty-second term of Associate Justice Sandra Day O'Connor's tenure on the Court. 2002 Term Opinions of the Court, Supreme Court of the United States, archived from the original on February 4, 2004, retrieved July 7, 2010 . 2002 Term Opinions Relating to Orders, Supreme Court of the United States, archived from the original on November 2, 2004, retrieved July 7, 2010 . 2002 Term In-Chambers Opinions, Supreme Court of the United States, archived from the original on February 14, 2004, retrieved July 7, 2010 .